You’ll find there is no shortage of RV dealerships in the Blue Springs area, which alone can make it quite challenging to know where to begin your search for a new RV. Whether you’ve never shopped for a travel trailer or are new to the area, you may not know how to determine who you can trust. You can make the most out of your budget by following a few simple tips passed along by consumer experts. Ask friends and family members within your community to provide you with a referral to an RV dealer who sells travel trailers in Blue Springs. Chances are, you’ll know at least one person who has purchased an RV in recent years. You can consider a referral to be an excellent way to choose a dealer. Locals often refer acquaintances to Liberty RV for the best deals on new and used RVs and travel trailers in Blue Springs. We invite you to browse the massive online inventory to see why they are considered the premier dealer in travel vehicles, campers, fifth wheels trailers, and more. Click on ‘New’ or ‘Used’ to get started or type your preferred model into the search bar. Check the Liberty RV website for used 2016 Jayco Jay Feather travel trailers in Blue Springs in lightly used condition. Priced right, this model can help you maximize your budget on an amazing travel trailer that sleeps 7. Space saving Murphy beds fold up and out of the way to make room for daytime activities. See the online listing for photos, pictures of the floorplan, model specs and additional amenities. You’ll love the tub/shower combo private bath that will make traveling feel more like home. New Prime Time LaCrosse models are priced at Liberty RV at $15,000 lower than the manufacturer’s suggested retail price. The LaCrosse features a rear bunkhouse, outdoor kitchen, kitchen island and numerous must-have amenities that can accommodate up to 9 campers comfortably! You’ll have to see the specs for yourself to believe everything that comes with this spectacular travel trailer- simply click on the listing to find pricing and details. 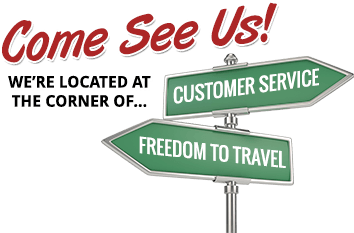 Visit the ‘new arrivals’ section on Liberty RV to see what’s new on the lot or make a call to a sales specialist at 816-415-CAMP to discuss your goals. If you have an RV you’d like to trade in, fill out the online submission form and include all of the details about its condition and features. You’ll find Liberty RV is able to offer you the best trade in value on their travel trailers in Blue Springs. Purchase the RV of your dreams from one of the most reputable dealers in the region when you call or stop by Liberty RV Travel Trailers in Blue Springs. Financing is available to help you pay off your RV over a 15 year or 20 year term, with low monthly payments designed to fit a range of budgets.